We had 9 teams, 2 of which only had 3 players for the scramble, so a total of 34 players. We saw the sun for just a couple of holes, but had to suffer overcast skies for the rest. Phil Cooke & Pete Moffit watch Robin Wilson putt out on 16………. Next Wednesday the bus leaves for Las Colinas at 8am from the Al Kasar car park. 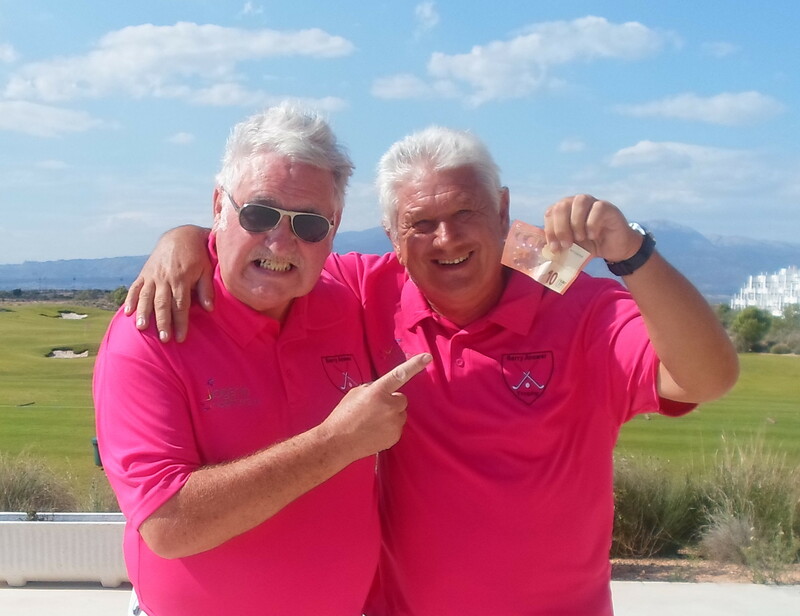 Please have 55€ in cash with you – Dave Lloyd will collect the green fees on the bus, as the golf club will not allow play until ALL monies have been paid up front. The first group are away at 10.30 and the last at 12.00. The groupings have already been chosen, and the order of play was drawn on Friday night………….Dave has the list. The bus will depart at 5.30pm to get back to the Clover for the Wednesday evening roll up meeting. Then the draw for the Anniversary Trophy will take place at 8pm. It would be nice if our members could wear the red society shirts…….but if you haven’t one, any red shirt (Viking Cup?) or a previous society one (blue/plum/green/yellow). The Anniversary Trophy takes place next Friday. There are still places available for the carvery at Camposol golf club from Alicia or Kim (15€). The bus is full and will leave from Al Kasar at 7pm. the current holders of the trophy are Pete Ridley and Pete Moffit………..
Notice from the golf shop…………….. I inform you that the Next 14th and 21st of March (Mondays) at Alhama Signature there are no buggies available for Alhama Golf Society due to there are a competition of Murcia Golf League and they made their buggies reservations in June. (Alhama Golf Society made in September). So Alhama Golf Society can play both days without buggies or change to another course if you need them. Maybe Lynn & Neil will soon be retiring, so here are some memories. every night was party night……………….. I think Neil would agree that this was the best sporting night ever in the Clover when Europe came back from nowhere to win the Ryder Cup………. 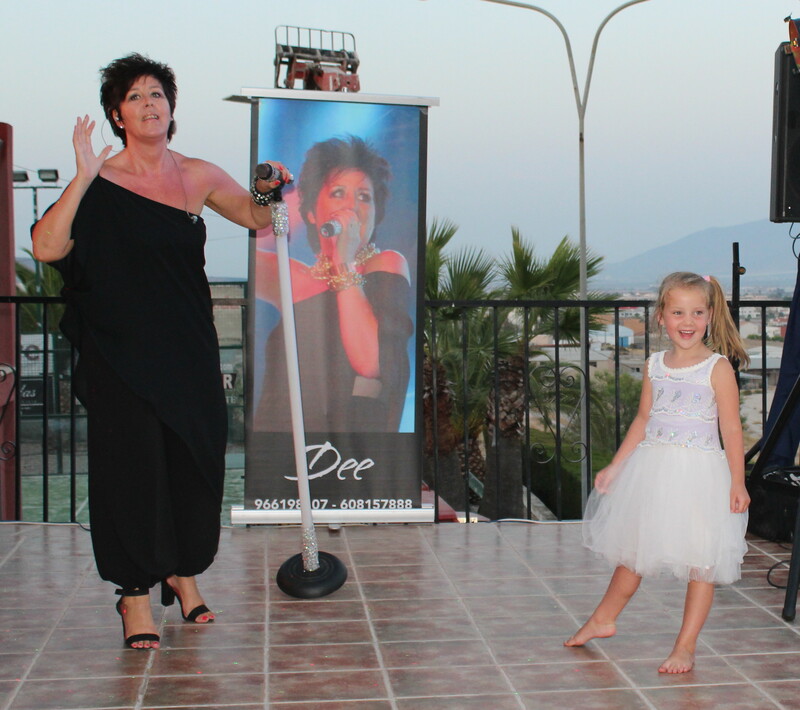 Lynn always liked a bit of fun………..
this time behind the bar with Belen……………. 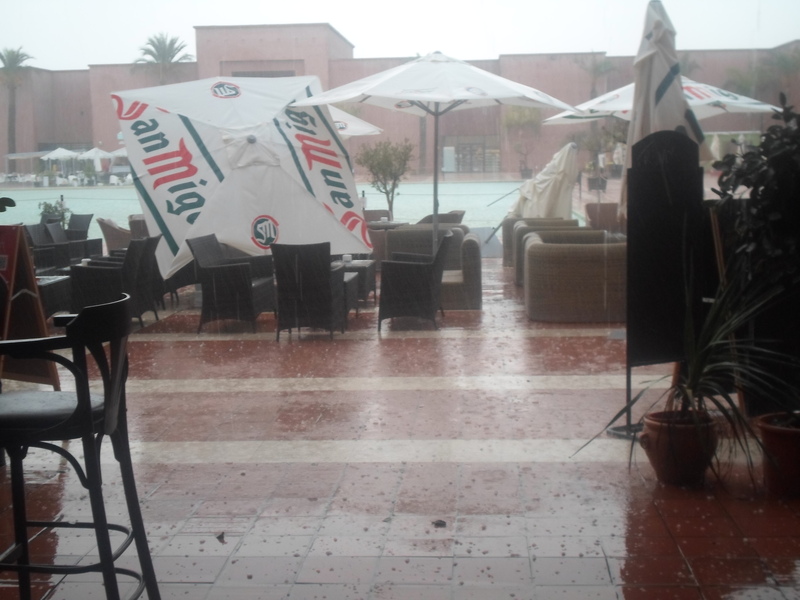 and the Clover provided a safe haven against the Gota Fria……a great place to get trapped……….. Please not the date, time and venue for the Condado de Alhama Golf Society Annual General Meeting. Mick says to Paddy, ‘ Why have ye got an empty bottle of milk in yer fridge?’ Paddy replies, ‘ in case anyone wants a coffee widdout milk’. Sunset at 6.30pm on the way to the presentation at the Clover……………..
After last week’s bad weather it was another lovely day at Condado for the pairs event. We had 44 players (22 pairs to make the maths easy) and there were plenty of good scores with 8 players scoring 36pts or more. To top it all Jeff Lightle had a hole in one on the 7th, which was his fifth ace! His partners thought that his ball must have landed in the bunker because they never saw it bounce – that was because it pitched directly into the hole! Ray Rollett was especially unlucky when his partner retired after 2 holes, which meant we could not give him a ghost card to add to his score, which could easily have seen him in the prizes. Ray had one of his best days, coming in with the best score of the day – 39pts. a token gesture for Ray………a sleeve of balls. Kim & Dave are always up there in the prizes……..
My first round for 5 weeks after injuring my ribs, but Alicia made my comeback much easier by playing so well. Jeff gets his momento for his hole-in-one………. so cold after the golf that we had to go inside……..
A busy period is almost on us…………next week is a 4 person texas scramble, followed by the awayday to Las Colinas on Wednesday February 3rd. Then the first major of the year is 2 days later, the Anniversary Trophy (drawn out pairs). This looks to be a busy day with 56 players already on the start sheet. The evening presentation will be at Sensol golf club with a carvery meal. There are still places available at 15€, but the bus is full. The new red society shirts are selling fast, so see Kevin if you want one. The forecast for Friday was rain, which visitors are used to but the residents are not. At 10am the rain was only light, but with such a bad forecast a few golfers cancelled. At the end of the day it seemed a good decision, with heavier showers out on the course forcing some back to the clubhouse. 30 players on the list, 27 started, 20 finished……………well done!!!!! Phil must be used to playing in the rain……..
At the presentation captain Dave Lloyd said he had looked on Google for a term which describes a collection of golfers who liked playing in the rain. He had to make his own up for Wikipedia…………. idiots!. An interesting article this week shows that our Condado de Alhama course has moved from #78 to #43 in the top 100 courses in Spain. Maybe the judging was done before we had water in all the lakes, so perhaps we will move up the rankings again next year……………. At the committee meeting this week it was decided that now that the lakes are full, play them as a hazard and conform to normal hazard rules. last week Ken Saunders would have had to take a penalty drop…………. Also Mondays and Wednesdays have recently been a problem, with players entering after play rather than before. There will be a list on the bar (not in the shop) of players due to play, and gives you the option to enter the comp or not. If you do not indicate you are not in the comp you will be expected to pay the 2€ entry. The diaries for 2016 are now in the Clover bar, so pick one up when you get here. For those not here and wanting to book flights, the fixtures for 2016 are now on the blog (under fixtures tab). The sheet for the awayday at Las Colinas on February 3rd is now full, as is the bus. The draw for pairs for the Anniversary Trophy 2 days later will take place on the bus, and I will post the draw on the blog Wednesday night. A reminder that the red society shirts for 2016 are now available from Kevin. they will be sold at cost price (15€). One of our members has asked that I mention the problem with pitchmarks on the green. If you are a good enough player to hit a shot to the green and it lands on it, please celebrate by repairing the damage, not having a shot of alcohol! I am fairly certain that generally this problem is caused by visitors rather than society members, but please take note. TEACHER……… Now class, who discovered America? TEACHER….. Donald, what is the chemical formula for water? TEACHER…… Donald, what are you talking about? DONALD……. Well Miss, yesterday you said it was H to O.
TEACHER….. Jeff, your composition on ‘My Dog’ is exactly the same as your brother’s……..did you copy it? TEACHER…….. Harold, what do you call someone who keeps talking when nobody is interested? Another beautiful day for golf at Condado, with 36 players trying to take the first monthly trophy of 2016. No wind, and a perfect temperature of 22 degrees in the shade. Torkild Dahl reports that it is -14 degrees in Norway! A very close run competition, with 4 of the 36 players tying on 36pts, so nobody beat par on the day! Jan specialises in Apollo Air trophies…………. Chris was one of the 4 players on 36pts………. Jim continued his good form………………. Edith was also on 36pts…. Thanks to Ian & Christine Lawson who volunteered to be the starters on Friday. Dorothy Simpson has taken on the role of recruiting starters and preparing the rota, so if you can help any week let her know when you are available. The more starters we have, the less burden on those who volunteer. The list for the awayday to Las Colinas on February 3rd is now in the golf shop. The list is already full with reserves. If you are down but can’t play, please cross off your name as early as possible so reserves can be included and informed. There is a free coach on the day to take the players to the course and bring them back later. If you don’t require the coach please indicate on the list. Tickets are now on sale for the anniversary trophy evening presentation, which will be held at Camposol golf club. There will be a disco and a carvery, and the price is 15€ each including coach transfers. TICKETS FROM ALICIA AND KIM AT THE CLOVER ON WEDNESDAY OR FRIDAY EVENINGS. This year’s society shirts will be red, and will be on sale soon at 15€ each. The society will not take any profit, they will be sold at cost price. Now that ALL the lakes have now been filled with water, there will be no compulsory penalty drops for balls that are playable inside the red markers……………just that the appropriate rules will apply if players decide to play the ball as it lies. Next week is another individual stableford, no overall winner, just 3 divisions. Not much to report over Christmas and the new year, so a few more jokes. Two fat blokes in a pub. One says to the other ‘Your round’. The other says ‘So are you, you fat bas***d’. I was reading this book today – The history of glue. I couldn’t put it down. I went down to the job centre and the recruitment consultant asked me ‘What do you think about voluntary work?’ I said ‘ I wouldn’t do it if you paid me’. Apparently one in five people in the world are Chinese. There are five people in my family, so it must be one of them. It’s either my mum or my dad. Or my older brother Colin. Or my younger brother HoChaChu. But I think it’s Colin. It is good to report another great year for the society, with all major and special events in place. Rather than expand more, we have decided that we should consolidate what we have and do everything better, with a few tweaks. From a high of over 800 members a couple of years ago we finished 2015 with just over 600. Thanks to all the sponsors who have supported us in 2015, the list keeps growing. And now to the review! It was a cold start to the year with frost delaying the tee-off times, but it was good to see the lakes being filled at last. 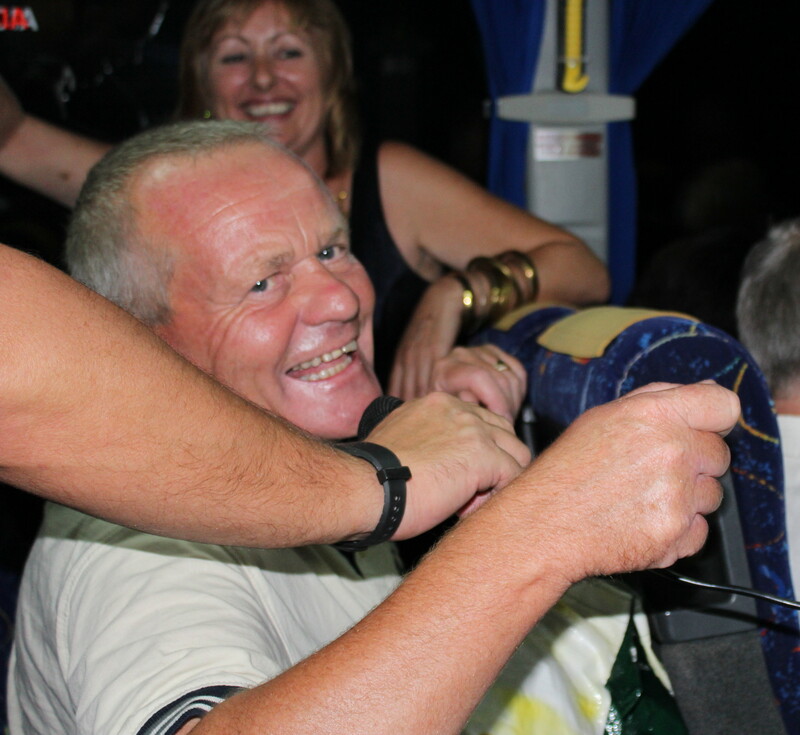 At the start of the year the committee decided to have a weekly raffle for a green fee voucher (provided by IRM) which over the year has funded free buses and entertainers for major events. Thanks so much to Alicia Saunders and Kim Lloyd who gave up their time to circulate around the bar persuading the customers to part with their money! At the AGM in March it was voted by the members present to make Monday and Wednesday competitions qualifying events. The reasoning behind this was to have more information to make our handicap control over members more current. Now we have almost one year’s records, so handicaps within the society should be more accurate. Also any players renewing their membership are required to submit their home handicap (which will be checked). The society now operate under EGA rather than CONGU rules which has meant that some members from UK & Ireland had their home handicaps reduced to conform with the continental slope system. Dave Lloyd took over the captaincy from Dave Rollett in May, and appointed Neil Simpson as his vice captain. 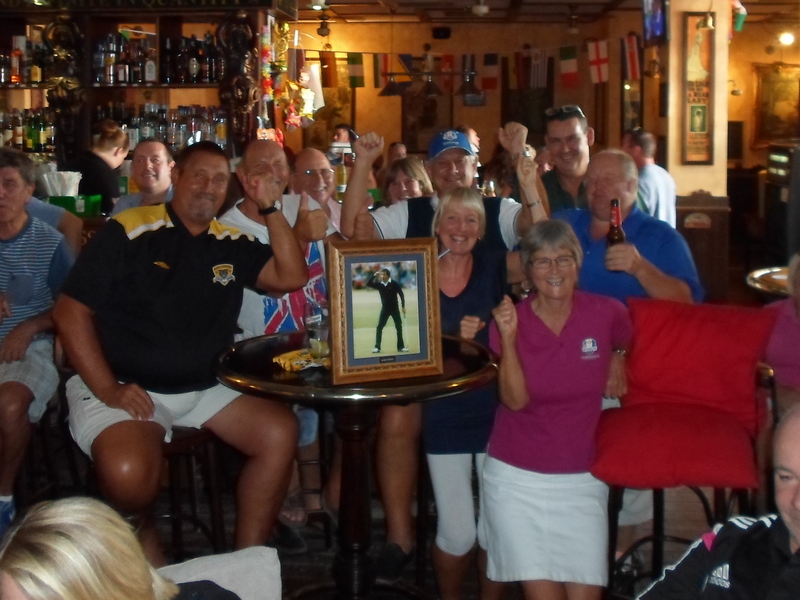 Due to maintenance work on Condado it was necessary to the change the venue for Dave’s captain’s day competition, but it proved to be a fantastic day at a really good price – we could not have been looked after better by the staff at Hacienda del Alamo. We lost one of our members in June when Hans Pfeister passed away suddenly. Condolences to his family and friends. October as always, was our busiest month of the year with the Barry Answer trophy, Apollo Air, Aguilon Ryder Cup qualifiers, Viking Cup and the Seniors trophy so we were filling the course each week. UK & Ireland won the Viking Cup to level the series at 3 wins each. November and December brought a bit of calm, and the residents were able to get their names on the start sheet without trouble. So we had 9 majors, 12 Apollo Airs, 4 Dublin Crystals, and a few special events in the year’s calendar and it was nice to see new names on the trophies. The first major of the year celebrated the anniversary of the society formation, and Cher was a good choice to mark the event. March started with the usual Irish fun day……………………..
you don’t have to be a golfer to join in and enjoy!……..
and the winners of drinking cava from a cup are………. Well, if we have an Irish comp the brits can’t be left out…………. Shortly after Barry Answer went missing…………………. In May we raised over 1200 euros from the Seve Trophy and this went to Edale Mountain Rescue. It was nice to see a party of ladies from Huddersfield join us and add to the donations……. Captain’s Day was in June this year, and after the singer swallowed a fly we got this……………..
Dave Lloyd’s pussycats are freelance………….. 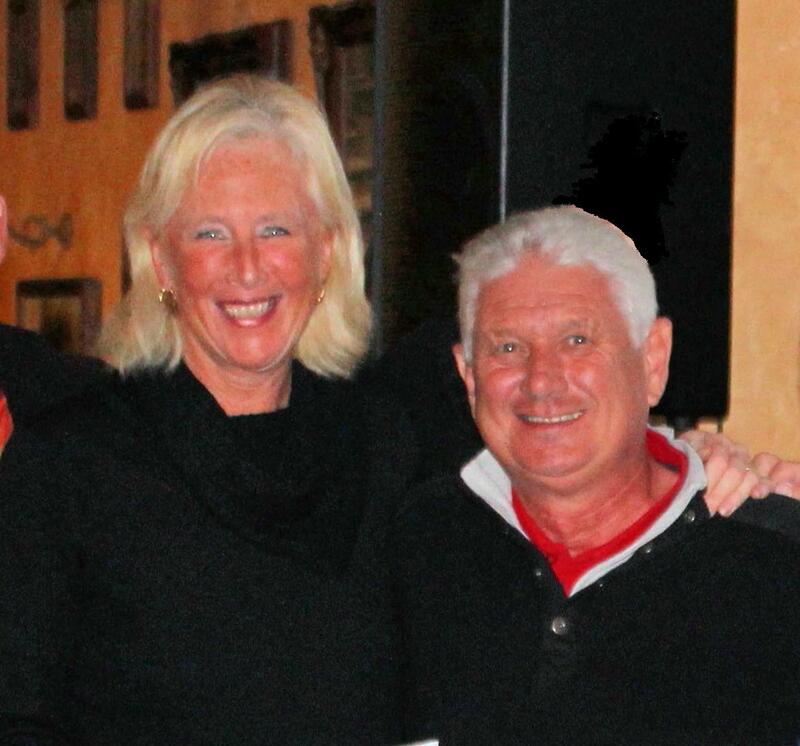 The Strokeplay major was in July and we had another Norwegian winner, Annie Kittlesen, followed by a good party at Totana tennis club with my favourite act, Dee. Jim leads the conga……..if they think he knows where he is going they are mistaken………. a lovely Yorkshire lass who will be back in July by popular demand……….. The President’s Day presentation was held on the balcony at Camposol golf club, and for a change we had a barbequeue. Eating al fresco with the lights of Camposol and the mountains surrounding us……..
Peter Reeves was in the prizes again. A good photo with president Dave Rollett…………..
Ladies Day at Bar Med………………..
a thorn between two roses…………. The Barry Answer Trophy started off a busy October…………….he fancied his chances but lost his bet (as usually does on the horses!). A very special event with our Paqui getting married!……………….. 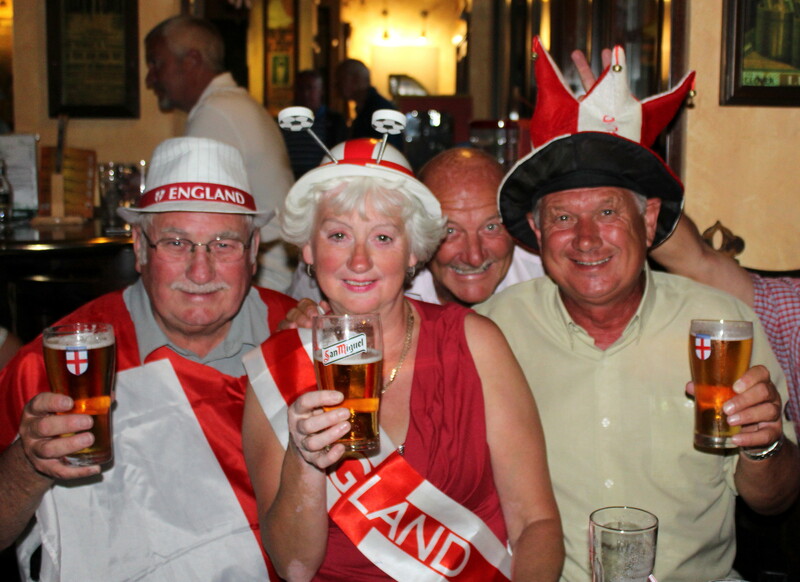 The Viking Cup party gets bigger every year………………..
UK & Ireland win the Viking Cup!……….. The Seniors competition finished off a very busy month……………..
Les doesn’t even need 2 legs…………..
Everyone joined in the party spirit for the Clover Xmas competition, mince pies, mulled wine, funny hats, funny rules?………………..
And to finish a few nice portraits from this year …………..
Oh, nearly forgot……….maybe the highlight of the year was the last blog – jibjab!